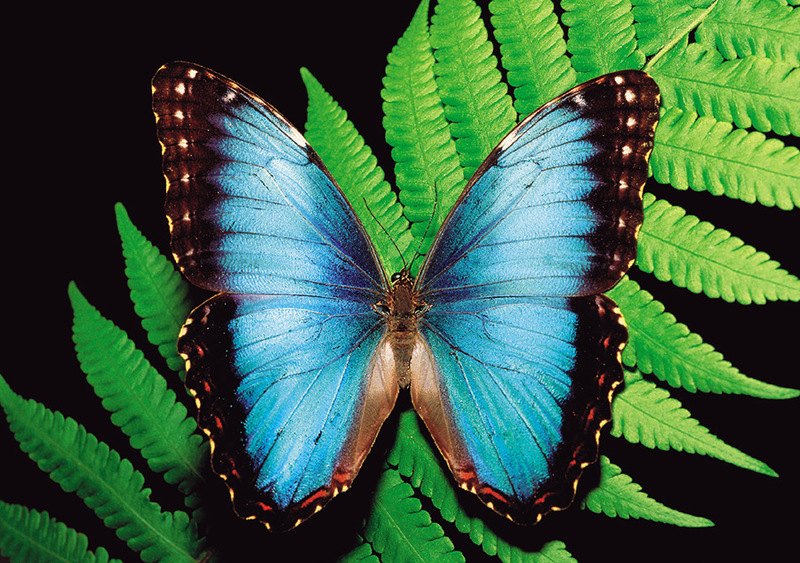 Blue morpho butterfly on fern, Costa Rica. Photograph by Kevin Schafer. With its five- to eight-inch wingspan, the blue morpho butterfly (Morpho peleides) is not only one of the world’s most strikingly beautiful butterflies but also one of the largest. A native of tropical forests from Mexico to South America, it has a lifespan of less than four months. Much of its adult life is spent on the forest floor, wings folded, feeding on liquids such as tree sap and juices from decomposing fruit. When looking for a mate, however, it takes flight, flashing its bright blue wings all the way up to the treetops.